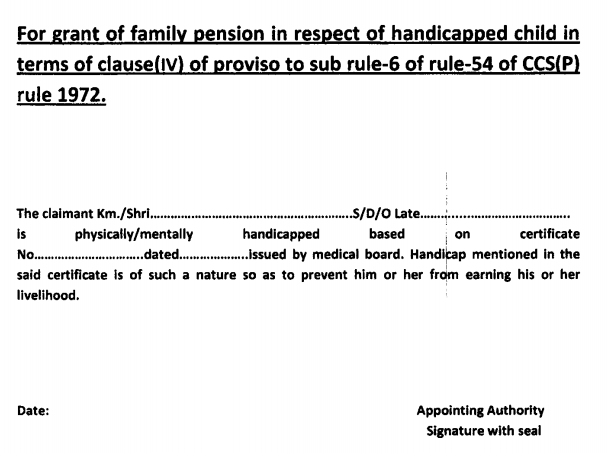 Of late, it has come to notice that unable to earn livelihood certificate which is mandatory for grant of family pension in respect of handicapped child in terms of clause (iv) of proviso to sub rule – 6 of rule 54 of CCS (Pension) Rules 1972 is not being submitted with pension claims. Due to these shortcomings, this office is compelled to return the claims to HOOs which ultimately results into avoidable delays and hardship to the pensioners. 2. A format regarding unable to earn livelihood certificate is enclosed herewith which should be countersigned by the appointing authority and supported with disability certificate issued by the medical board in terms of clause (iv) of proviso to sub rule -6 of rule 54 of CCS (Pension) Rules 1972. 3. In view of the foregoing you are requested to issue suitable instructions (along with copy of this circular) to all the Head of Offices under your administrative control to ensure that claim on the subject matter are floated in accordance with clarification given in above Paras. Ordnance & Ordnance Equipment Factories. Sub : Unable to earn livelihood certificate for Family Pension in respect married disabled children- clarification regarding. Copy of Pr. Controller of Defence Accounts (Pension) Allahabad letter No. Gl/C/067/Vol-XIV/Tech dated 21-04-2017 ( Circular No. C-163) on the above subject is forwarded herewith. Factories/Units are requested to take necessary action accordingly. 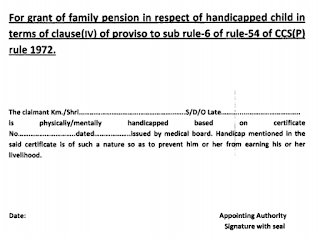 It has come to notice that unable to earn livelihood certificate which is mandatory for grant of family pension in respect of handicapped child in terms of clause (iv) of proviso to sub rule – 6 of rule 54 of CCS (Pension) Rules 1972 is not being submitted with pension claims.